To receive a marriage license, couples in the state of Maine must submit an intention of marriage form along with a separate form recording both parties' Social Security numbers. This documentation can be obtained from the website of the state of Maine. The document must be signed in the presence of a notary clerk or municipal clerk. State Of Maine Intention of Marriage Form Step 1: The groom should enter their full name, including any suffix. State Of Maine Intention of Marriage Form Step 2: The groom should enter their complete address and their age. State Of Maine Intention of Marriage Form Step 3: The groom should enter the full name and birthplace of both parents. State Of Maine Intention of Marriage Form Step 4: Below the section reserved for the groom, the bride should enter all her information. The only additional requirement is that she include her current last name and, if different, her maiden name. State Of Maine Intention of Marriage Form Step 5: Under the "marital status section," both parties should enter the number this marriage will be. If previously married, list the name of your last spouse and the date on which the marriage ended. Specify with a checkmark whether the marriage ended by death, annulment or divorce. State Of Maine Intention of Marriage Form Step 6: If the bride or groom are already registered as a "domestic partner" in Maine, they should note this where indicated, provide the date on which granted this status and the court where this took place. State Of Maine Intention of Marriage Form Step 7: First cousins must check "yes" where indicated and provide a certificate of genetic counseling. State Of Maine Intention of Marriage Form Step 8: At the bottom of the page, the bride and groom should provide their current address, as well as date and place of birth. State Of Maine Intention of Marriage Form Step 9: Note where and when the ceremony is expected to take place. Include the name and contact information of the presiding official if known. 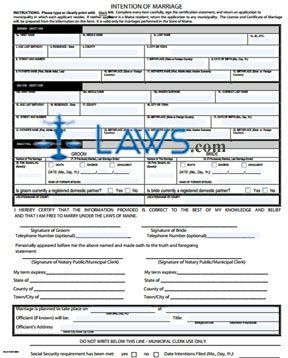 State Of Maine Intention of Marriage Form Step 10: Sign and date the document before the appropriate official. State Of Maine Intention of Marriage Form Step 11: Complete the Social Security form with the identification numbers of the bride and groom.